The goal of The Meridian Interns Program (an after school art making and management program) is to provide high school students with a comprehensive educational experience in the arts and a unique introduction to non-profit management and community service -- one in which they have a direct role. This mural was conceived and created by 16 teenagers who participated in the summer session of the Meridian Interns Program. 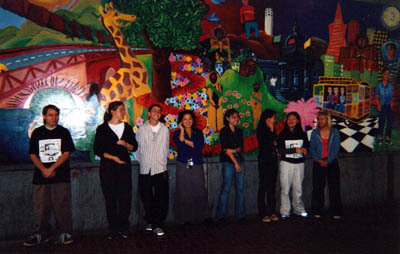 The youth researched murals throughout San Francisco and drew from a variety of natural settings. The final product is a collaboration between all of the youths involved under the guidance of four artist-instructors. This was a collaboration with high school students in the Meridian Interns Program (MIP). Together we thought about art and work and how they affect all of our lives. We created a spider's web out of "ladders" made from paper clips symbolizing what we do to get ahead on the ladder(s) of success and our thoughts on work and art were written on legal pads and our doodles, the things we do when we are supposed to be working were on yellow post-its displayed along the walls of the gallery.